ALAMEDA, Calif. -- Much was expected out of cornerback Gareon Conley by Jon Gruden and the Oakland Raiders this season, a year after a shin injury limited the 2017 first-round draft pick from Ohio State to two games. And while Conley has been relatively healthy -- he came back earlier than expected from a strained hip suffered in the first practice of training camp -- and has been a mainstay on defense this season, his snap total dropped off dramatically last weekend. And with Daryl Worley returning from an NFL-mandated four-game suspension last week, Conley is in jeopardy of losing his starting gig at right cornerback. Besides, defensive coordinator Paul Guenther said Tuesday that Conley is "basically a rookie player" and a "work in progress" for a defense still trying to find its identity heading into this weekend's game in London against the Seattle Seahawks. "He is learning a lot of things," Guenther said of Conley. "Unfortunately, he gives up the one play off the goal line and we are in a pretty good call to stop it." 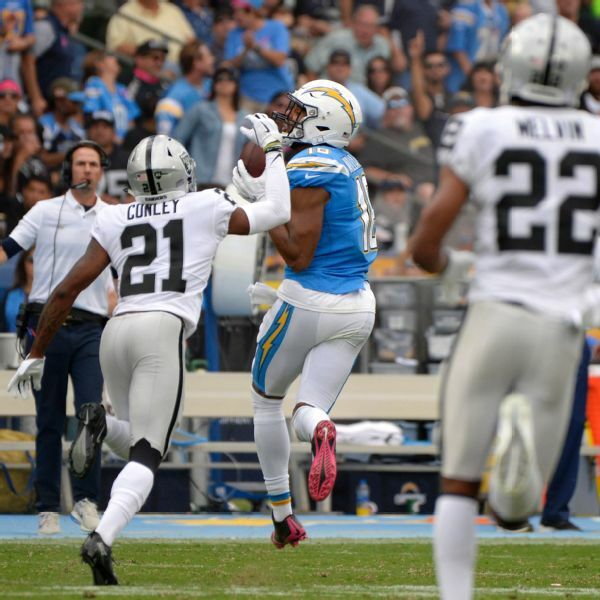 Late in the third quarter of Sunday's 26-10 loss at the Los Angeles Chargers, one snap after Derek Carr's end zone interception, the Raiders had the hosts on their own 4-yard line. But Chargers receiver Tyrell Williams blew by Conley down the left sideline and Philip Rivers hit him in stride for a 48-yard gain. "I don't want to give (Conley) too much right now," Guenther added. "If we can give him little by little by little, just like a normal rookie player, that's how I'm viewing Gareon. He really only played one-and-a-half games last year and he sat out pretty much through the offseason. It's no different than a young player. He's a work in progress." After playing 57 defensive snaps (90 percent) in the season opener against the Los Angeles Rams and then tying for the defensive lead with 64 snaps (97 percent) in Denver in Week 2, Conley played 31 snaps (70 percent) at Miami and 55 (68 percent) against the Browns. But against the Chargers, Conley had just 12 snaps (19 percent), behind fellow corners Worley (49 snaps), Rashaan Melvin (40 snaps), Leon Hall (39 snaps) and Dominique Rodgers-Cromartie (19 snaps). "Worley played good," Gruden said Monday, when asked if Conley's lack of playing time was related more to his struggles or to Worley playing well. "Worley is a good player. Gareon had a couple of struggles ... (and we're) trying to find a right mix, trying to find a right mix at a lot of positions. Daryl Worley is a good player. I think he was second on our team in tackles. He earned a right to be out there." Indeed, Guenther has been rotating different combos at corner, starting games with Melvin on the left side and Conley on the right. But against the Chargers, Oakland also paired Rodgers-Cromartie on the left with Worley on the right. Conley, Melvin and free safety Reggie Nelson each have an interception this year, but Conley has a 36-yard pick-sixagainst the Browns' Baker Mayfield. The Raiders are No. 30 in total defense, allowing 404.4 yards per game; No. 23 in pass defense, at 277.2 yards per game; and are giving up 6.8 yards per play, the second-worst such figure in the NFL. Conley, meanwhile, has an overall grade of 58.9 from Pro Football Focus, which ranks 77th out of 116 qualifying cornerbacks; a coverage grade of 55.2, which ranks 85th of 116; and a tackling grade of 31.5, 110th of 116. Worley allowed four catches in five targets for 17 yards while making four total stops against the Chargers, which constitutes a "loss" for the offense, per PFF. "Worley came in and played really good for his first game," Guenther said. "That added an extra guy to the mix so it's a battle at corner right now ... everybody is competing for jobs and we are going to go with the hot hand. "I want to eventually get to two starting corners and we are settled there. Obviously, Daryl came back. He was one of our best corners all offseason and he proved it again on Sunday that he is a high-level player. We will just see how it goes; really based upon what the snaps are, the situation, on how guys are playing."